Afferent loop syndrome is a known complication of pancreaticoduodenectomy. The incidence may be as high as 13%, and survival of 3 years or longer is the only factor associated with its development. Surgical, percutaneous, and endoscopic treatments of afferent loop syndrome have been described, but such treatments are not always feasible. Successful treatment through EUS–guided hepaticogastrostomy has also been reported by our group. 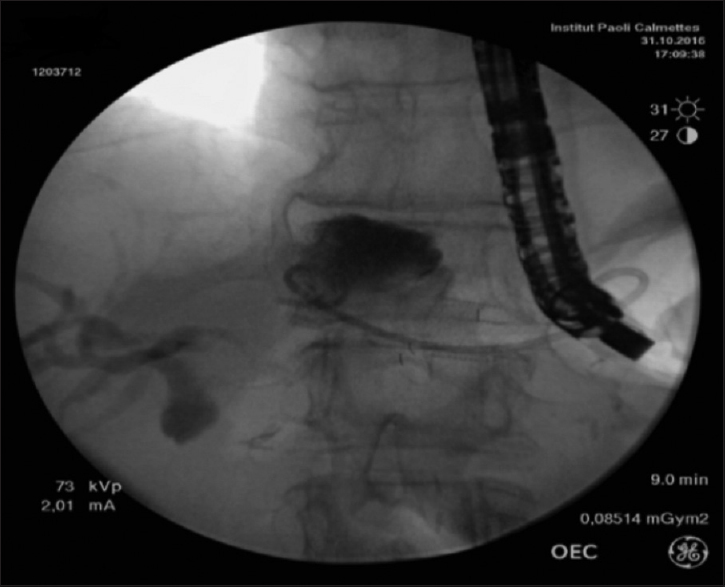 We herein present a video case of EUS-guided gastroenterostomy for afferent loop syndrome treatment with SPAXUS® stent (Taewong Medical, Gyeonggi-do, South Korea). An 80-year-old man, who had undergone Whipple surgery in 2012 for pancreatic adenocarcinoma, was referred for abdominal pain and fever associated with bile duct and afferent loop dilation. A nodule of carcinomatosis localized in the gastrojejunal anastomosis, which was causing the obstruction, was punctured, and carcinoma relapse was histologically confirmed [Figure 1] and [Figure 2]. Transgastric puncture of the dilated afferent loop was performed with a 10-Fr Cystotome™ (Cook Medical Ireland, Limrick, Ireland)). 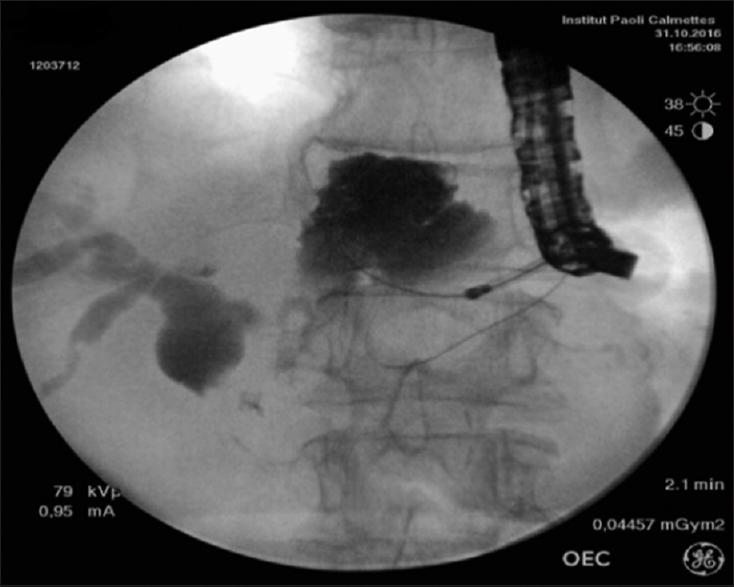 Contrast was injected for fluoroscopic viewing of limb and bile duct dilatation [Figure 3]. The incision was enlarged with the 10-Fr Cystotome after insertion of a 0.035-inch guidewire (G-FLEX®, Nivelles, Belgium). A 2-cm-long × 16-mm-diameter ASPAXUS® stent (TaeWoong Medical, Gyeonggi-do, South Korea) was deployed under fluoroscopic view. An 8-mm Hurricane dilatation balloon (Boston Scientific Corp, MA, USA) was then used to dilate the tract within the lumen of the NTI-S™ SPAXUS® stent (Taewong Medical, Gyeonggi-do, South Korea), and a 7-cm × 7-Fr pigtail stent was inserted within the stent to prevent migration [Figure 4]. No serious complication was reported after the procedure, except for abdominal pain, which was managed with analgesic. The patient was discharged 4 days after the procedure. The patient died 3 months after the procedure because of disease progression. EUS-guided treatment of afferent loop syndrome has been reported using transgastric plastic stent insertion, metallic stent (NAGY and AXIOS),, and also hepaticogastrostomy, as we have already mentioned. To our knowledge, this is thefirst reported case of treatment with the SPAXUS® stent. 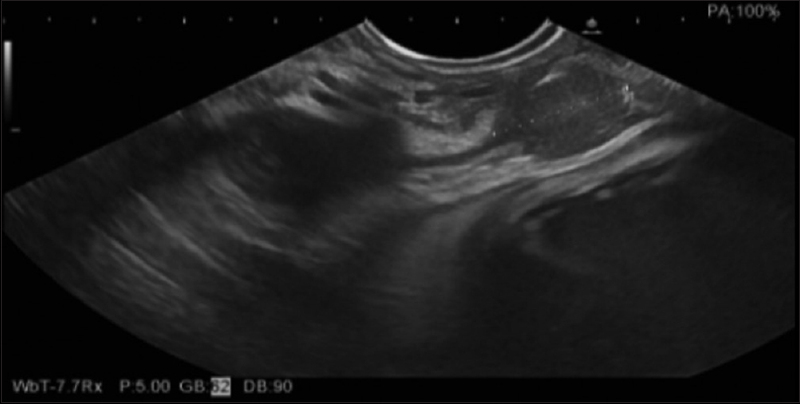 EUS-guided gastroenterostomy in this clinical case was performed safely and efficiently, but larger series is needed to evaluate the procedure. The authors certify that they have obtained all appropriate patient consent forms. In the form the patient has given his consent for his images and other clinical information to be reported in the journal. The patient understands that his name and initial will not be published and due efforts will be made to conceal his identity, but anonymity cannot be guaranteed. This work was not supported by any funding sources, grants, or sponsorships. Pannala R, Brandabur JJ, Gan SI, et al. Afferent limb syndrome and delayed GI problems after pancreaticoduodenectomy for pancreatic cancer: Single-center, 14-year experience. Gastrointest Endosc 2011;74:295-302. Ratone JP, Caillol F, Bories E, et al. Hepatogastrostomy by EUS for malignant afferent loop obstruction after duodenopancreatectomy. Endosc Ultrasound 2015;4:250-2. Matsumoto K, Kato H, Tomoda T, et al. A case of acute afferent loop syndrome treated by transgastric drainage with EUS. Gastrointest Endosc 2013;77:132-3. Shah A, Khanna L, Sethi A. Treatment of afferent limb syndrome: Novel approach with endoscopic ultrasound-guided creation of a gastrojejunostomy fistula and placement of lumen-apposing stent. Endoscopy 2015;47 Suppl 1:E309-10. Chowdhury SD, Kurien RT, Bharath AK, et al. Endoscopic ultrasound-guided gastrojejunostomy with a Nagi stent for relief of jejunal loop obstruction following hepaticojejunostomy. Endoscopy 2016;48 Suppl 1:E263-4.